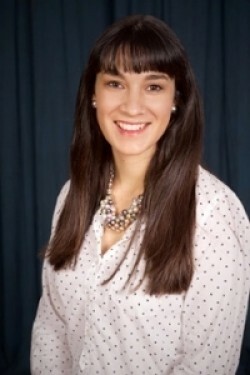 Daniella C. Bardalez Gagliuffi is a doctoral candidate in the Center for Astrophysics and Space Sciences, part of the Physics Department at University of California, San Diego. She studies brown dwarfs which are celestial objects intermediate between stars and planets with insufficient mass to sustain hydrogen fusion in their cores, which is the nuclear reaction that powers stars. As a consequence, brown dwarfs cool and dim over time, harboring atmospheres that resemble those of giant planets like Jupiter. Her dissertation explores the frequency with which brown dwarfs are found in systems of two compared to isolation, since this statistic holds a clue to the formation pathway producing brown dwarfs. Her research contributes a new technique to identify and characterize such binary systems. Her long-term research goals are to characterize brown dwarf and planet formation pathways.